The best productions and singing that kept vigil in a dark year. Vigil in a wilderness of mirrors: Nina Stemme (center) in Tristan und Isolde. 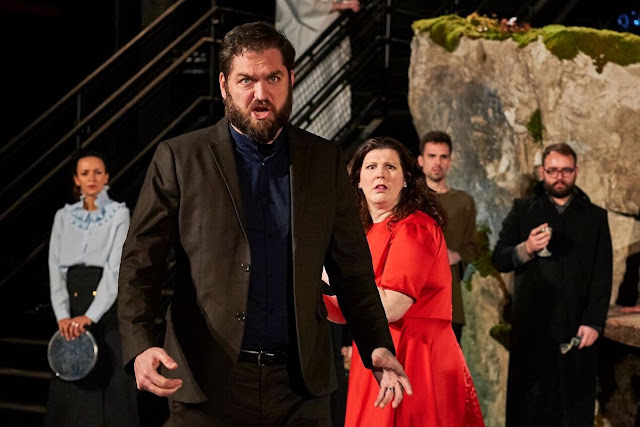 This was an interesting year for opera, marked by Rossini rarities, 18th century operas worthy of the occasional revival and a season-opening Tristan und Isolde that left audiences enraptured and traditionalists confused. 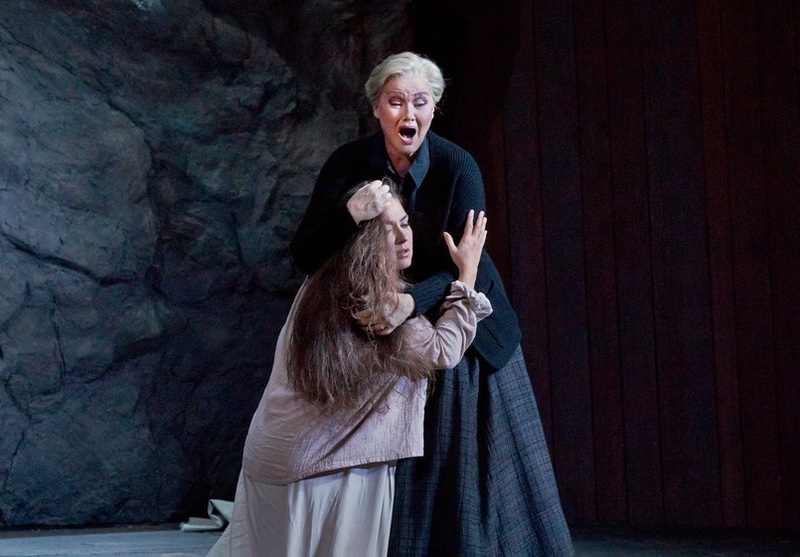 Plus the Met did some wish fulfillment (for this writer anyway, finally staging Rossini's Guillaume Tell. 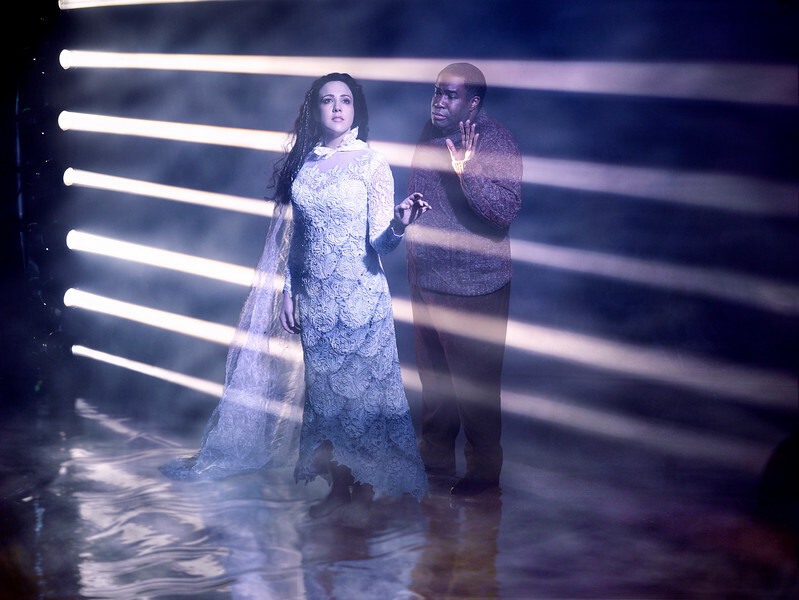 Here are ten of the many fine opera performances reviewed on Superconductor in the year 2016. L'Amour de Loin at the Metropolitan Opera. 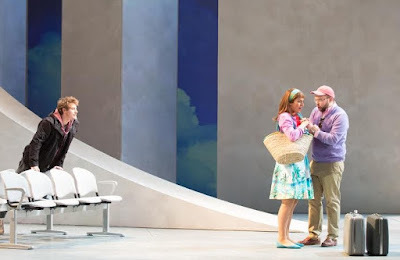 Susanna Philips (top) Tamara Mumford (left) and Eric Owens in L'Amour de Loin. Last night, the Metropolitan Opera played its last 2016 performance of Kaija Saariaho's opera L'Amour de Loin. This the first opera by a female composer mounted at the Met since 1903, and it served as a kind of manifesto for this company's mission in this uncertain new century.L'Amour de Loin (the title means "Love From Afar") is Ms. Saariaho's first opera, and it premiered at the Theatre du Chatelet in Paris in 2000. 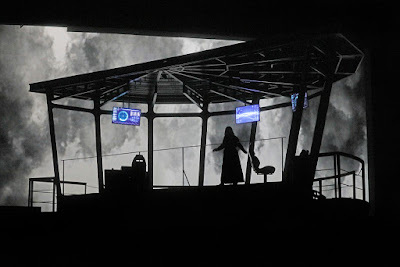 This production featured Susanna Philips and Eric Owens, American stars who have risen to prominence in the last decade, as well as the stage direction of Robert Lepage, an artist whose successes at the Met are still overshadowed by the colossal failure of his staging of Wagner's Ring. The New York Philharmonic premieres (most of) Wynton Marsalis' new symphony. 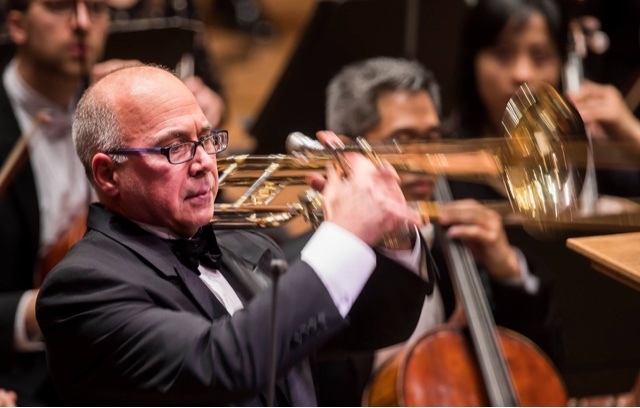 Trombonist Joseph Alessi was the featured soloist at the New York Philharmonic on Wednesday night. Photo by Chris Lee. Copyright 2016 The New York Philharmonic. 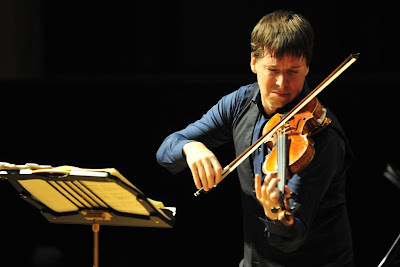 In 1957, the nexus between the tradition of European classical music and American jazz was dubbed the "third stream" by the late composer Gunther Schuller. On Wednesday night at the New York Philharmonic, Alan Gilbert and his orchestra essayed this dangerous crossing with the world premiere of Wynton Marsalis’ new symphony The Jungle (Symphony No. 4). It shared the program with works by Aaron Copland and William Bolcom that also explored this juxtaposition of musical styles. We look at the best intimate concerts of a troubled 2016.
of 2016. 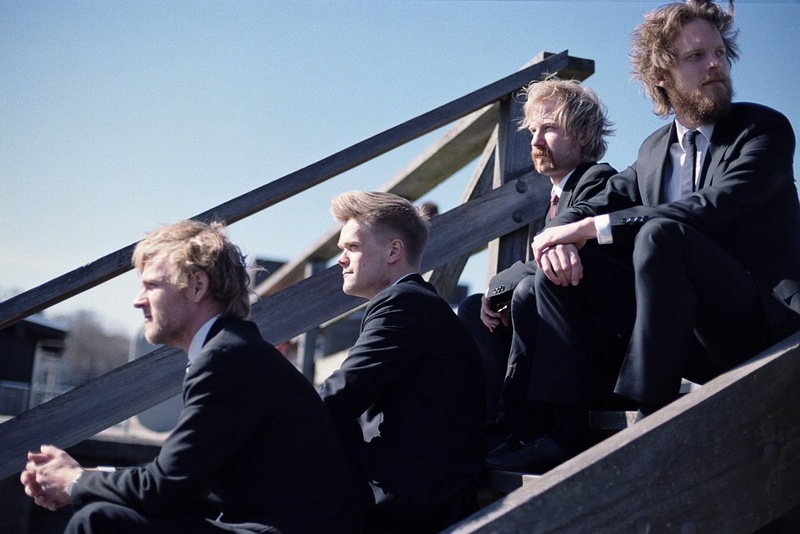 Photo © 2016 The Danish String Quartet. 2016 may have been a difficult year, with a lot of musical high points. 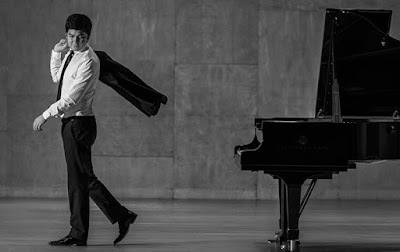 Here, Superconductor cherry-picks the ten best small scale vocal recitals, chamber concerts and piano recitals of the year that was, presented in chronological order. All hyperlinks connect to Superconductor reviews written by Paul J. Pelkonen. The best bombast of the year that was. 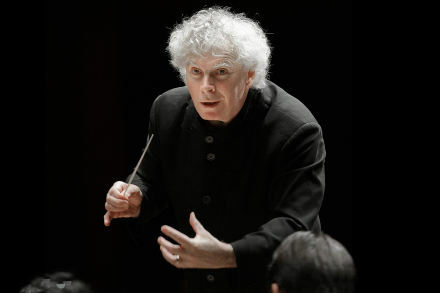 Sir Simon Rattle did his last tour with the Berlin Philharmonic. Photo © 2016 Berliner Philharmoniker Digital Concert Hall. Although this has been a dreadful year in many ways, it's been a good year for classical concerts. Here are ten memorable orchestra concerts reviewed on Superconductor in 2016. And we promise, nobody died during them. As always, links lead to full reviews, all written on Superconductor. A holiday reflection on the year that was. I've had a lot of deaths in my life, of family, friends, and people close to me. My father died on Feb. 11 1985. My uncle on Nov. 19 1999. My mother on March 8 2005. I used to obsess about these dates like I was living in perpetual Lent. A smartfew years ago, my very therapist pointed out to me that because of leap days every four years, what actual day I was mourning had shifted by one or two or three. 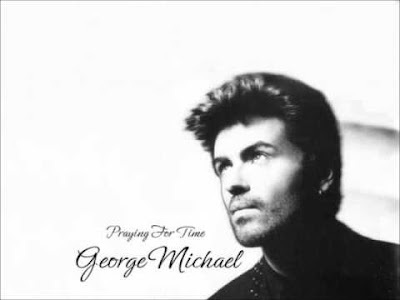 That got me thinking about the nature of time and the death of George Michael yesterday was the impetus of this post. "A pair of star-cross'd lovers take their life..."
Publicity photo of Diana Damrau and Vittorio Grigolo as Juliette and her Roméo. Photo by Kristian Schuller for the Metropolitan Opera. 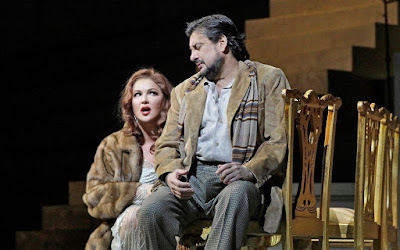 The Met unveils a new take on Shakespeare's classic story of doomed young love, with Vittorio Grigolo and Diana Damrau singing Charles Gounod's gorgeous music. This new production by Bart Sher was first seen at Salzburg and La Scala. It arrives at the Met on New Year's Eve. 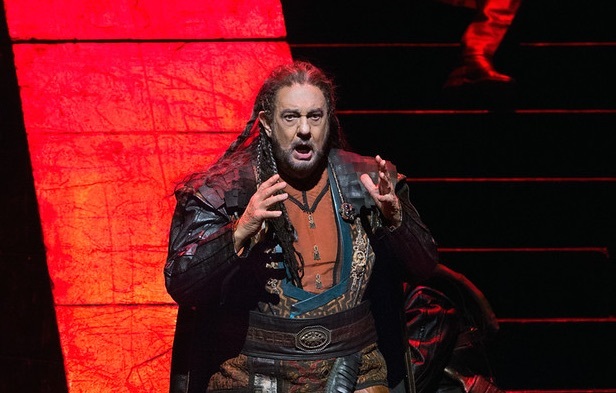 Plácido Domingo returns to the Met in Nabucco. King for a day: Placido Domingo raves in the title role of Nabucco. Photo by Marty Sohl © 2016 The Metropolitan Opera. The third act of Placido Domingo's long career has entered its late summer. 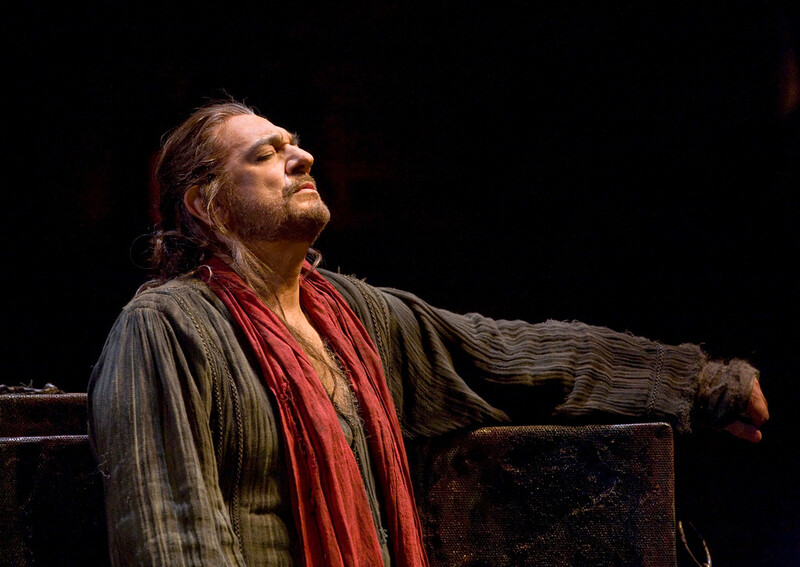 Starting in the last decade, the superstar tenor began taking on baritone roles in Verdi operas, expanding his repertory at a time when most singers decide to retire. The title role in the Metropolitan Opera's revival of Verdi's Nabucco is the fourth Verdi baritone part that he has sung at the Met since 2009. Mr. Domingo is now 75, but on Thursday night he brought fresh energy and a bold stage presence to the role. 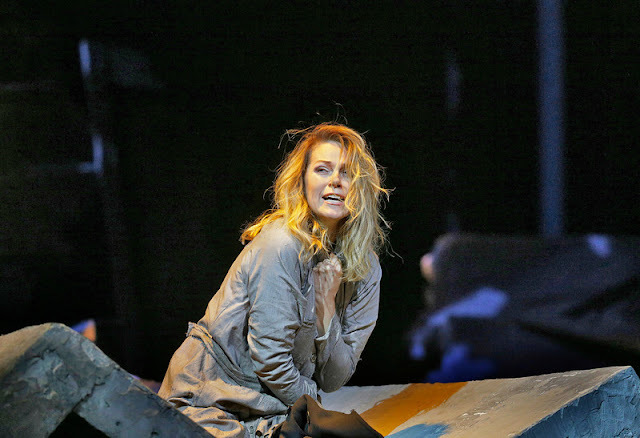 A plea for mercy or expediency in Mozart's final opera seria. 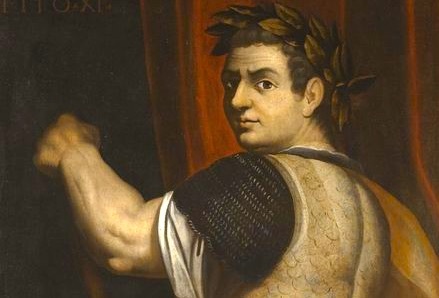 The Roman Emperor Titus. Portrait by Bernardino Campi. It's funny how necessity can make an artist productive. That was the case in 1791, the last year of Mozart's life. In July, the composer (already hard at work on a new piece called Die Zauberflöte) received a commission from one Domenico Guardasoni, to write a new opera celebrating the impending coronation of Leopold II. The Hapsburg ruler was already the Holy Roman Emperor, and he was about to be installed as as the King of Bohemia. The result, banged out in just 18 days was La clemenza di Tito, which premiered in Prague on Sept. 6. The opera represents Mozart's last thoughts on the genre of opera seria--he died on December 5 of that same year. Christopher Dylan Herbert revives Winterize. in the Brooklyn Botanic Garden. Photo by the author. Four years ago, New York baritone Christopher Dylan Herbert gave the first performances of Winterize, a unique "movable" outdoor performance of the Schubert song cycle Winterreise. 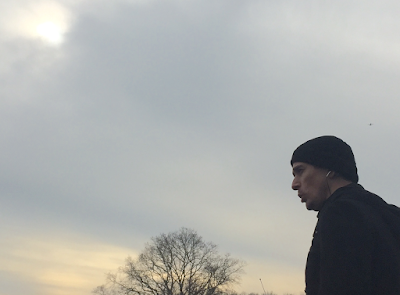 This morning, he revived his work among the bare branches of the Brooklyn Botanic Garden. Armed with portable radios playing the piano accompaniment to these twenty-four songs, audiences follow Mr. Herbert around the gardens, taking the "winter's journey" with him, a trip that starts with lost love and ends in hypothermia, madness and (presumably) death. An in-depth look at Verdi's longest and most troubled opera. 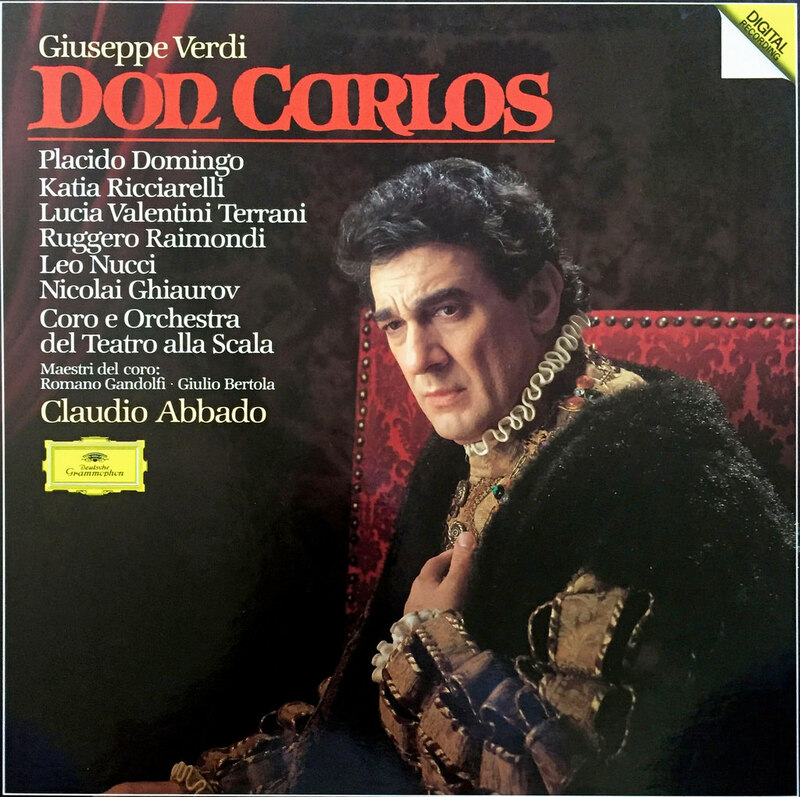 Placido Domingo in Don Carlos. 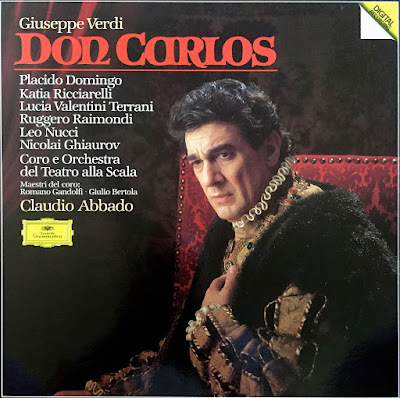 Giuseppe Verdi's Don Carlos is an opera that is beloved by Verdi lovers, but one that took a very long time to find its audience. Based on a searing play by Friedrich Schiller. Don Carlos was originally composed for the 1869 season for the grand stage of the Paris Opera. The premiere of its initial French version was a late-career failure for the Italian composer, one of three largely unsuccessful attempts that Verdi made in his life to conquer the hearts of Parisian opera-goers. (The other two, Gerusalemme and Le Vepres Siciliennes are less well known. Christian Gerhaher sings Gustav Mahler's lieder. 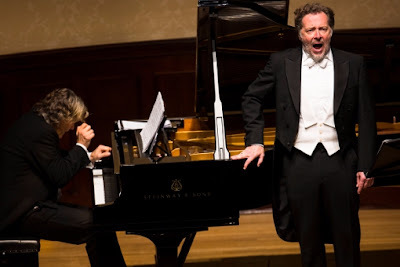 Gerold Hubner (left) and Christian Gerhaher in recital at Wigmore Hall. Photo by Simon Jay Price © 2014 Wigmore Hall. The name Gustav Mahler conjures up mighty images. Enormous choral forces, battling huge orchestras as they shouti in terror or triumph. A giant hammer, slamming out a crushing blow of fate at the close of his Sixth Symphony. Or the terrors of the nursery and the grave, present in equal proportion in his Fourth. None of those elements were present on Saturday night, as the longtime pair of baritone Christian Gerhaher and pianist Gerold Huber played a program of Mahler's lieder for a rapt audience at Lincoln Center's Alice Tully Hall. 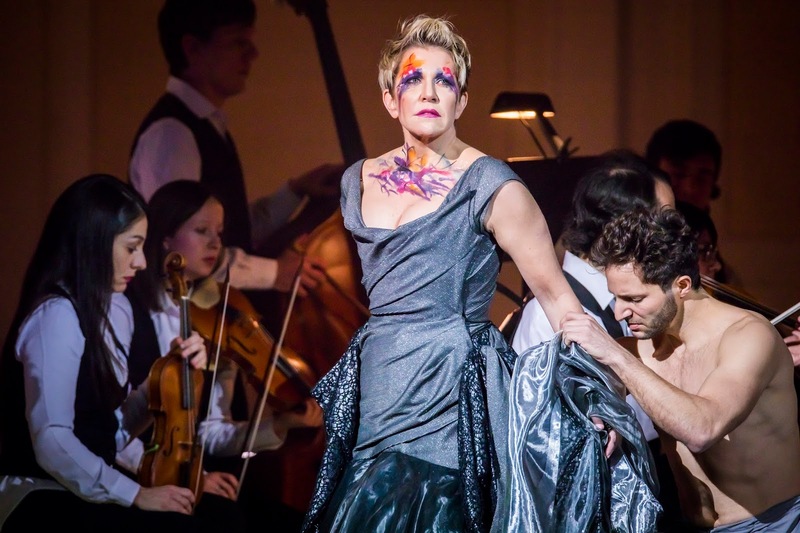 Joyce DiDonato sings of war and peace. Photo by Chris Lee © 2016 courtesy Carnegie Hall press department. 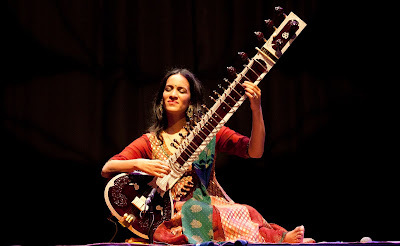 The Carnegie Hall Perspectives series provides artists with a blank slate, a freedom to mount dream projects upon the hallowed boards of the Perelman Stage. On Thursday night, it was Joyce DiDonato's turn. The mezzo-soprano offered In War & Peace, a program of baroque arias with period ensemble Il Pomo D'Oro. 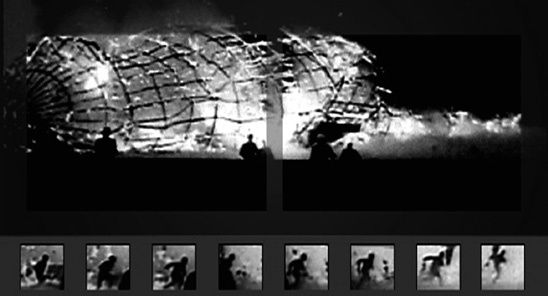 To it, she added back projections, rock concert lighting and interpretive dance, all elements as foreign to this staid environment as the cutting ring of a cell phone. There's nothing like Mozart for the holidays. The business model of the music business has changed. Classical labels still do tons of reissues but usually in the form of huge boxed sets that attempt to show an overview of artist's life, an orchestra's journey or a conductor's approach to his work. Thanks to their tireless efforts, there are still a lot of options if you want to leave a doorstop-sized boxed set under a loved one's tree. 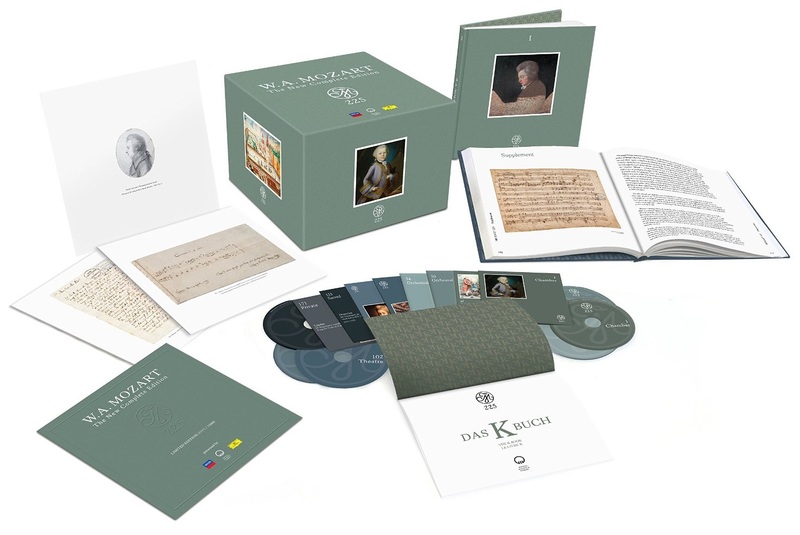 Here are the best box sets to come out in 2016. 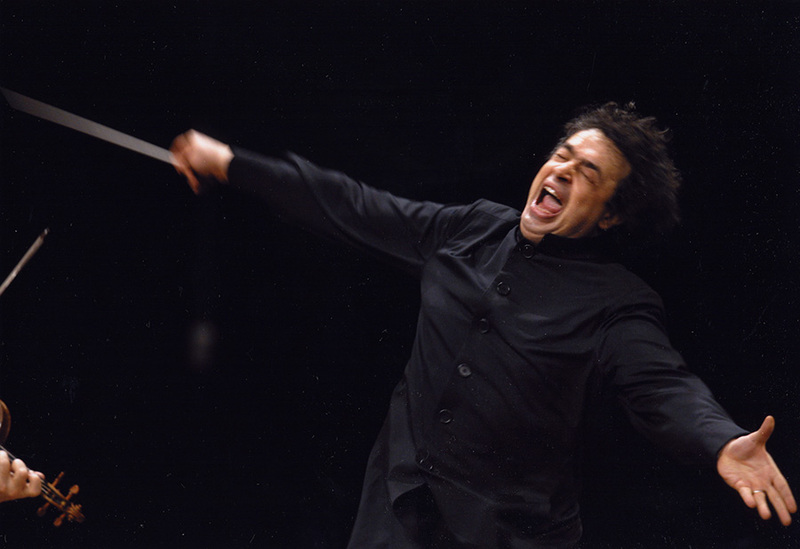 Jiří Bělohlávek leads the New York Philharmonic. 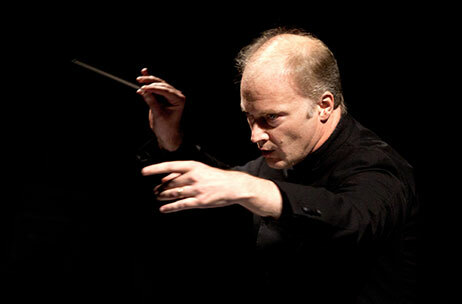 Conductor Jiří Bělohlávek. Photo by Peter Kadlec. 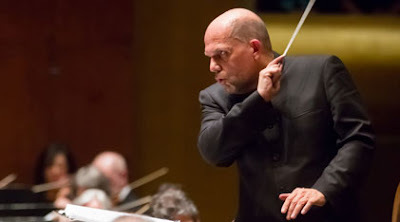 The schedule of the New York Philharmonic is a complex entity, bringing together soloists and conductors on the stage of David Geffen Hall and elsewhere, often in unique and unprecedented combinations. 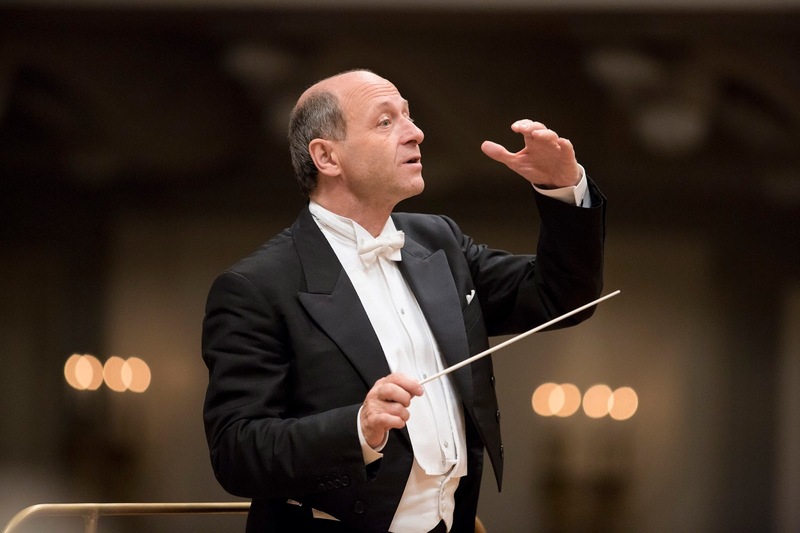 Last week's subscription program (heard Saturday evening featured an unusual combination: a conductor who hadn't appeared with the orchestra in thirty years, a pianist of note, and an overture not performed by the ensemble since 1983. 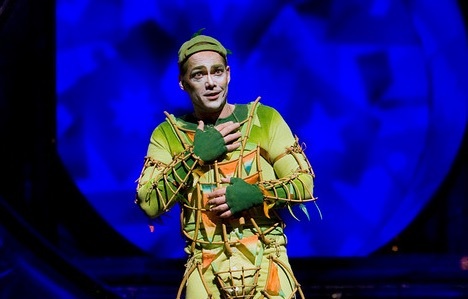 The birdcatcher returns to the Met to enchant the kids in Mozart's family-friendly fable. Christopher Maltman returns to the role of Papageno in this year's revival of Mozart's The Magic Flute. Photo by Cory Weaver © 2015 The Metropolitan Opera. sees Banco's ghost in Verdi's Macbeth. Photo by Robert Altman © 2016 LoftOpera. LoftOpera, that entertaining and ambitious company co-founded by step-siblings Brianna Maury and Daniel Ellis-Ferris has capped their 2016 season with their first grand opera, a new production of Verdi's Macbeth. For this show, Loft made an inspired if chilly choice, a long, high, recently renovated industrial space located in the heart of Brooklyn Navy Yard. The building will soon to be home to the Mast Brothers' new chocolate factory. 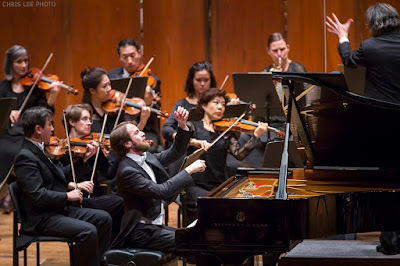 Daniil Trifonov returns to Carnegie Hall. 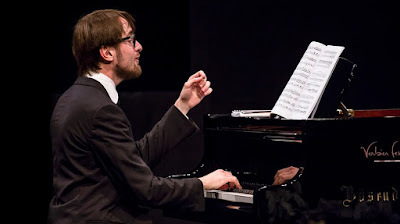 Daniil Trifonov in performance at the Verbier Festival. Photo by Nicolas Brodard © 2016 The Verbier Festival. The singer has bowed out of the upcoming Eugene Onegin for health reasons. 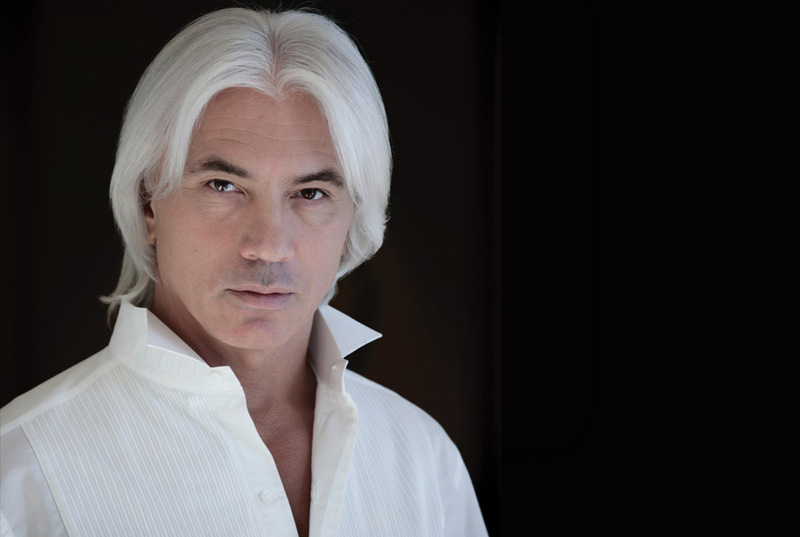 This morning, baritone Dmitri Hvorostovsky announced that he is withdrawing from fully staged opera performances "for the foreseeable future." 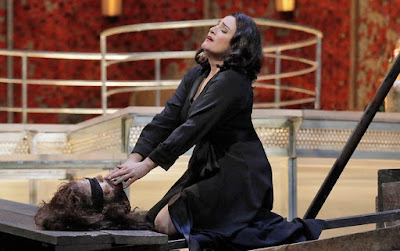 Patricia Racette brings her Salome to the Met. 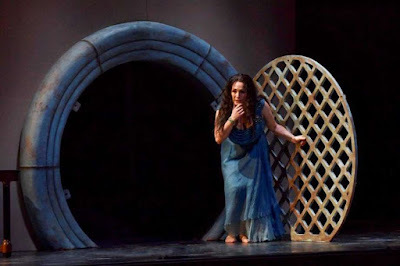 in the climactic scene of Salome. Photo by Ken Howard © 2016 The Metropolitan Opera. When the Metropolitan Opera announces a cast change in the weeks leading up to an important mid-season revival, opera critics sometimes get nervous. (Your humble blogger is no exception.) At the Met on Monday night where the company's first 2016 performance of the Richard Strauss shocker Salome was about to take place, a sense of foreboding, even trepidation hung over New York's largest opera house. Patrons crossing the plaza were unusually subdued. This revival (originally meant to feature soprano Catherine Naglestad) now starred a familiar Met trouper: soprano Patricia Racette. Ms. Racette, who has been acclaimed in past seasons but more hit-and-miss in recent years, had never sung this role before in New York. 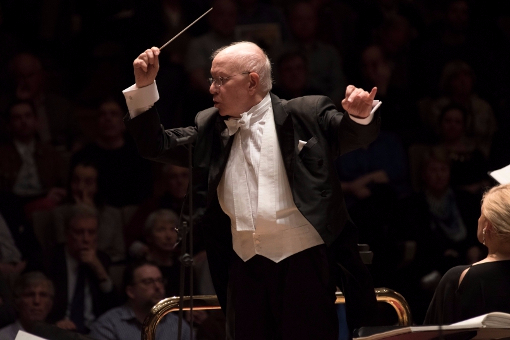 The Royal Concertgebouw Orchestra returns to Carnegie Hall. Conductor Semyon Bychkov in action. 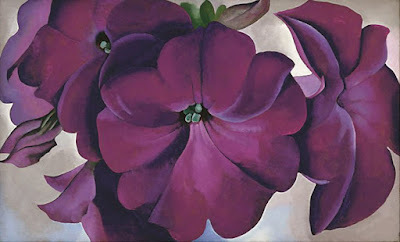 Photo from the artist's website. A visit to the former New Amsterdam from the Royal Concertgebouw Orchestra, Amsterdam's best known musical export is always an occasion for rejoicing. 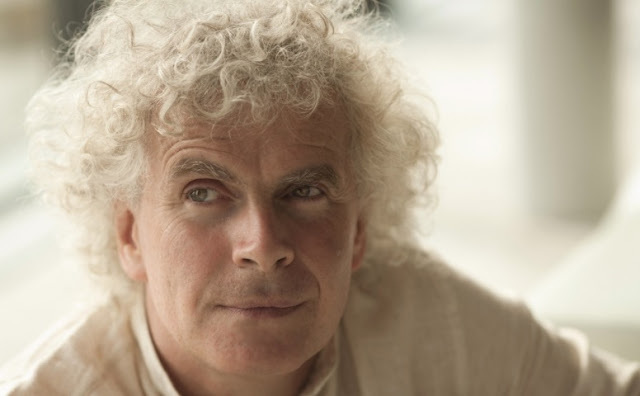 On Wednesday night, Semyon Bychkov and the Dutch players paired the New York premiere of Theatrum bestiarum by Detlev Glanert with Gustav Mahler's sprawling Symphony No. 5 in their return to the big stage of Carnegie Hall. 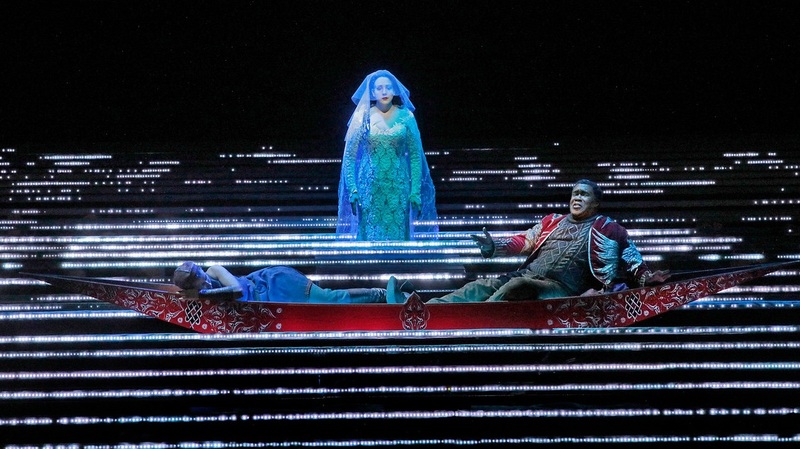 Plácido Domingo is the king of Babylon in Verdi's hokey but effective Old Testament opera. Plácido Domingo (seen here as Oreste in Gluck's Iphigénie en Tauride.) sings the title role in Verdi's Nabucco. 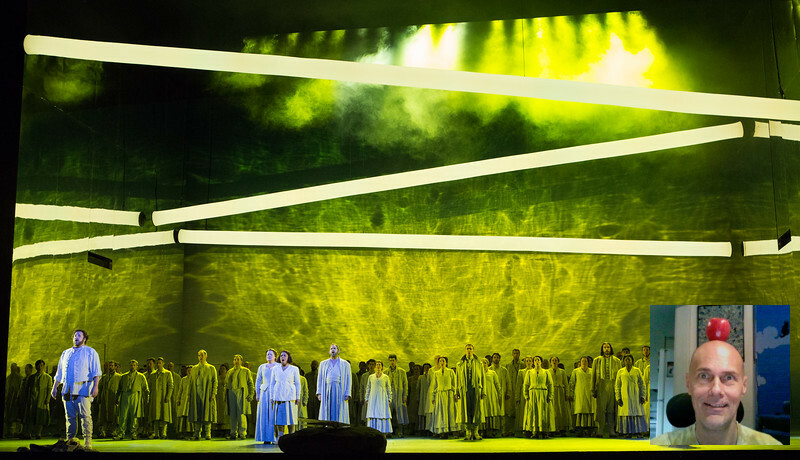 Verdi's early opera is an Old Testament epic with a towering title role and a chorus that you will never forget. For this revival, Placído Domingo steps into the gold boots of Nebuchednezzar, king of Babylon, captor of Jews and finally, convert to the faith. Some reflections on a lost album and my early love of music. Burt Bacharach. © 1971 A & M Records. Ever have one of those moments where music makes you travel back in time? 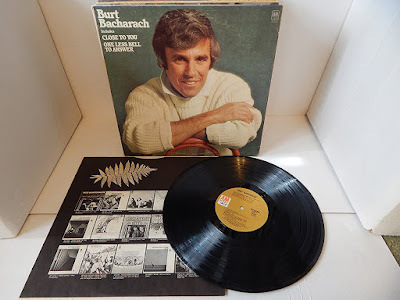 That happened to me last night around 1am, when I sat down very late, put up my feet, put on my big headphones and listened to the 1971 record Burt Bacharach, the fourth studio album from the composer and arranger who has been part of this country's musical landscape for an amazing sixty-four years. 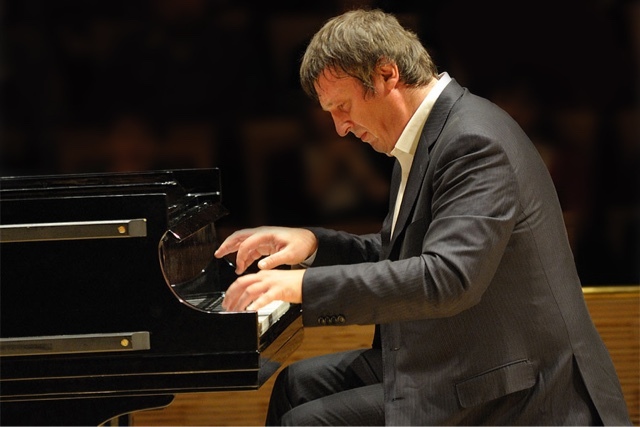 The pianist Boris Berezovsky returns to New York. The pianist Boris Berezovsky onstage at the Mariinsky Theater.. When the Russian virtuoso pianist Boris Berezovsky last gave a recital in New York City, Bill Clinton was president and Zankel Hall didn't evenexist. So Tuesday night marked the pianists debut at Carnegie’s modern subterranean venture, billed with a finger-busting program of piano études by Bartók, Ligeti and Liszt. 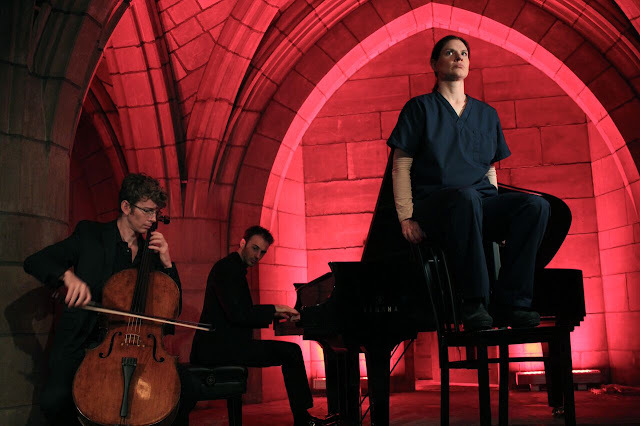 On Site Opera and the Crypt Sessions unearth The Tell-Tale Heart. 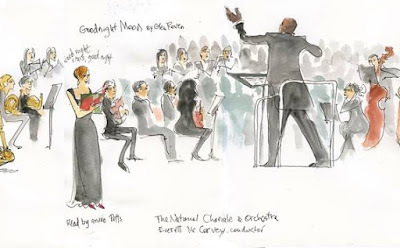 by Gregg Kallor (center) with cellist Joshua Roman. Photo by Andrew Ousley. There's nothing scarier than Edgar Allen Poe. 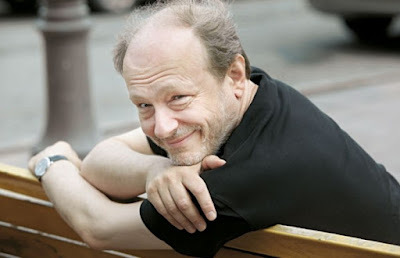 The writer and poet, who grew up in the Bronx and called New York home for much of his life is responsible for setting the template for the modern horror story, for inventing the detective tale, and for using simple words to give nightmares to millions of readers, this writer included. 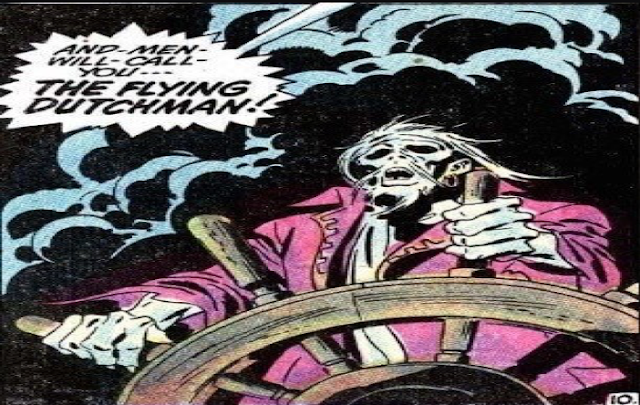 You can keep your tentacles, your chest-bursting aliens, your psychopaths wielding baseball bats bound with barbed wire: Poe's stories cut right to the heart of what terrifies us, our own inner demons and darkest moments laid bare for all to see. "Opera lover" ruins two performances at the Met. of Rossini's Guillaume Tell and L'Italiana in Algeri. Background photo by Ken Howard. I was on a train last night coming back from a performance at NJPAC when I checked my Twitter, and learned that Saturday's matinée performance of Rossini's opera Guillaume Tell was ruined when a man dumped a "white powder" into the orchestra pit at the Metropolitan Opera. 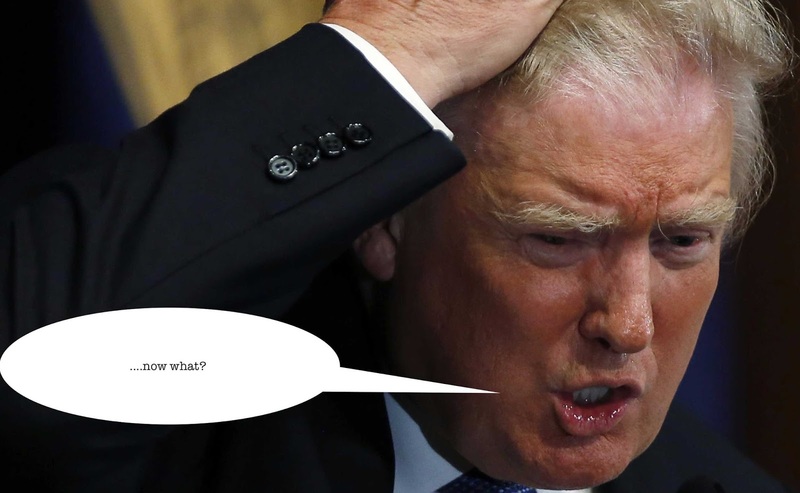 Here's a quick recap of the story, in case you haven't heard it by now. Labels: Anthrax Scare, Ashes, Ashes in Orchestra Pit, Guillaume Tell, Met Opera, Metropolitan Opera, Paul Pelkonen, performance cancelled, Roger Kaiser, rossini, Superconductor. 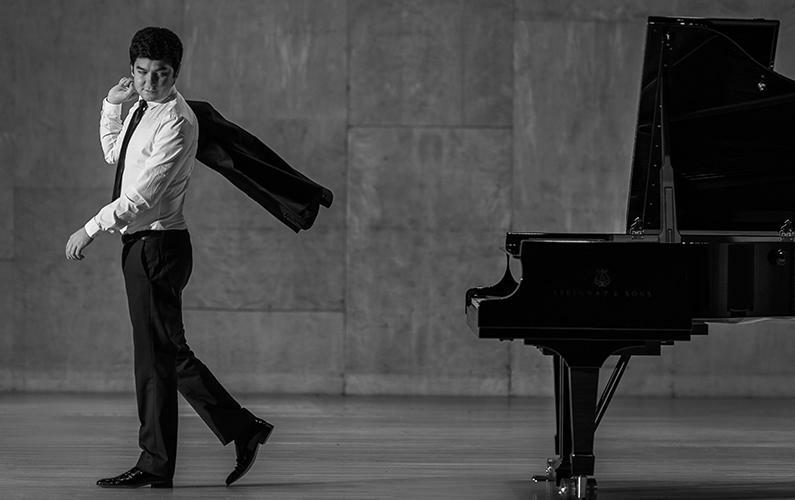 Pablo Heras-Casado returns to the New York Philharmonic. A subway musician: Pablo Heras-Casado underground. 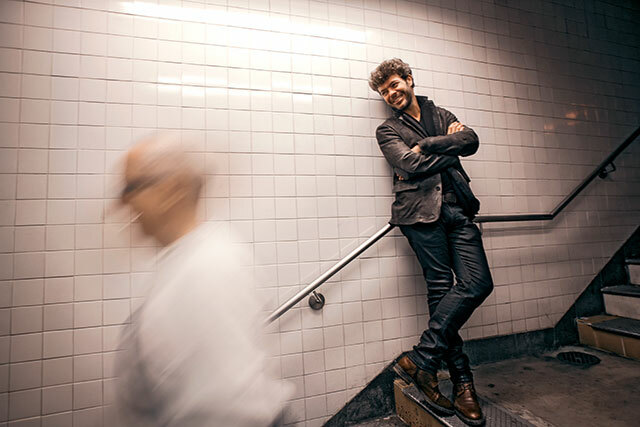 The Spanish conductor Pablo Heras-Casado has made a hell of a splash in New York, since arriving in 2011 to take over the helm of the Orchestra of St. Luke's. 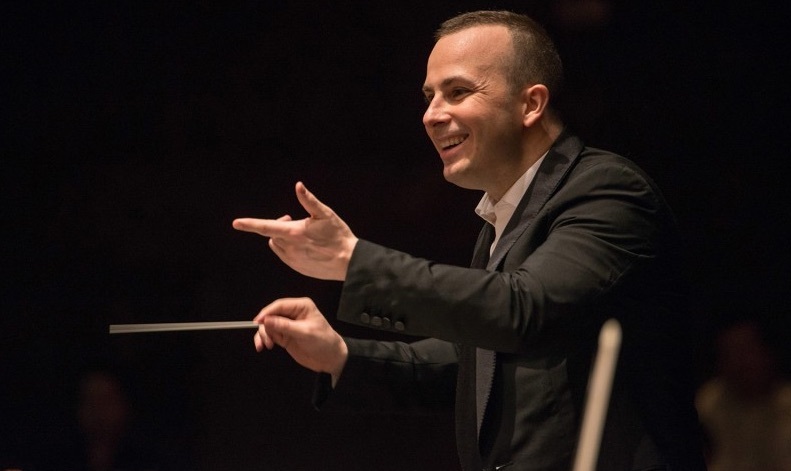 He has conducted at the Metropolitan Opera and at Carnegie Hall, earning enthusiastic accolades from reviewes for his fresh approach to music-making and stylish podium presence. On Friday afternoon, Mr. Heras-Casado conducted the New York Philharmonic in a traditional, conservative and satisfying program featuring the music of Béla Bartók, Max Bruch and Antonín Dvořák. The Orpheus Chamber Orchestra opens its 2016 season. 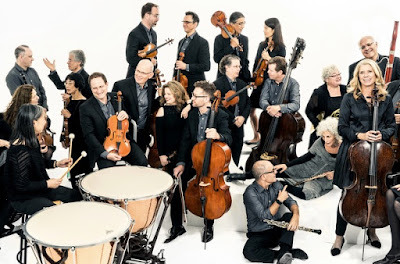 The Orpheus Chamber Orchestra occupies a unique place in the New York cultural landscape. This collective of musicians embraces a unique, cooperative approach to orchestral playing, rotating the roles of leadership and playing all of their concerts (whether at Carnegie Hall or on tour) without the benefit of a conductor. On Thursday night, Orpheus opened its 2016 season at Carnegie with a program featuring three trusty favorites and one new work. 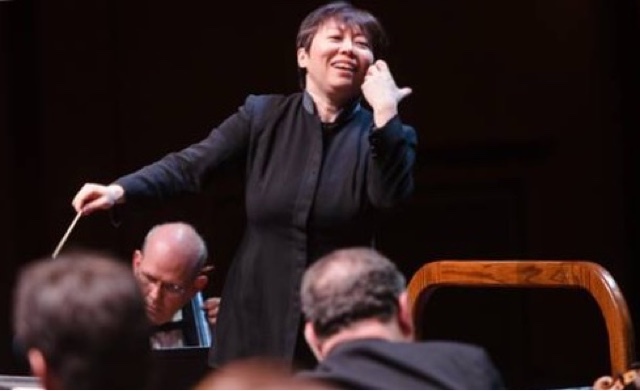 NJSO music director Xian Zhang makes her subscription debut. The changing of the guard at a symphony orchestra is a complicated process, often akin to the processional scenes from French and operas of the 19the century. For example, the New Jersey Symphony Orchestra has a new President, a new artistic administrator and most importantly, a new music director, the Chinese-born conductor Xian Zhang.